Mountain Camp Woodside offers a special Cub Camp program for campers ages 5 to 6 years and up to incoming 1st graders. Our cubs are split into four groups – Bear, Cheetah, Lion, and Tiger, with a maximum of a 12-campers to 2-counselors ratio. The Cubs participate in most of the same activities that older campers do, such as fencing and archery, but all activities are structured to be age appropriate and accommodate the learning styles of our youngest campers. For instance, during swimming periods, our Cubs wear life vests so they can safely explore our pool and they do not participate in mountain biking. Cub activities are scheduled and they do most activities twice. Our Cubs stay with their group throughout the entire day and are under constant supervision by our Cub counselors. Cub Camp gives children a chance to try all that camp has to offer in a supportive and structured environment – ideal program for a child’s first camp experience. To accommodate the younger ages, the Cub Campers’ day ends at 3:30pm. If your Cub Camper needs to stay until 4:45pm, “Extended Cub Care” options are available. Drop-off is from 8:45-9am each morning. We encourage you to use our drive-through system. Drop-off can be one of the hardest times a day for some of our younger campers, however going to camp is an excellent time for campers to grow, gain confidence and independence and to make lasting friendships! In our experience, campers rebound quickly and end up having a great day after they leave their parent or guardian. Sometimes parents staying around can cause the home-sickness to drag on. We take pride in our counselors and their ability to help your child gain independence and learn how to adjust by keeping them involved at camp. The normal cub pickup time is between 3:20 and 3:40pm at the main field. You can park in the main parking lot and walk onto the field to pick-up your camper. If you sign up for Extended Cub Care, you can pick up your camper in our no-park pickup system on the field between 4:45 and 5pm. Please bring your Pick-Up Placard with you for pickup for us to verify that you are authorized to pick-up your Cub. On Friday, we invite Cubs to stay for our Parent’s Program that starts at 4pm and ends at 5pm. Pickup for Friday will be in the PAC. Parents picking up at the normal time on Friday will pick up at the field. Campers signed up for horseback riding will be transported in camp vans to Spring down Equestrian Center each day from 2pm-3pm. 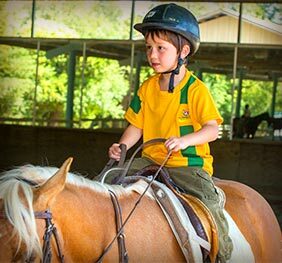 Our campers will receive a 1/2 hour of horsemanship lessons and 1/2 hours of riding lessons each day. Please visit www.springdown.com for more information. Horseback riding is offered for an additional $395 per week. Campers will need to bring socks and a long pair of pants, while Spring Down will provide boots and helmets and any other equipment. Swim Lessons are offered Monday-Thursday from 3:45-4:15pm. Lessons are semi-private, up to 3 campers per 1 instructor. Lessons are geared more towards new or beginner swimmers. Space is limited, so we recommend signing up fast to register your interest. While Cubs wear life-vests during their swim time, they will not wear life-vests during swim lessons. Swim lessons are offered for an additional $200 per week. 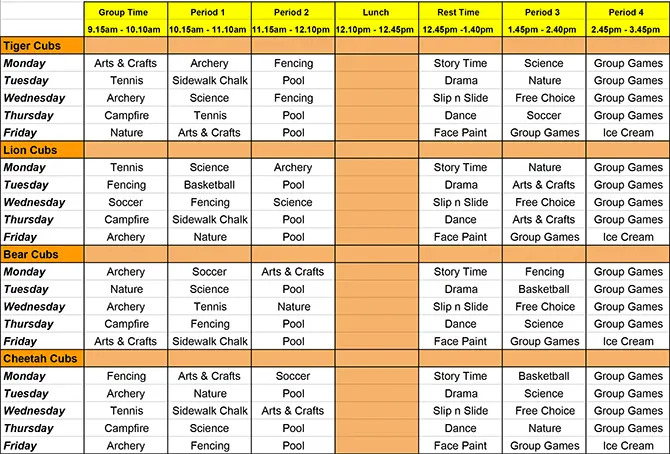 Here is an example activity schedule. We change it each week and introduce new activities, however it gives you a good idea of the weekly activities the cubs do. What activities will my cub get to participate in? Cubs get to try almost every activity at camp! They get to do archery, fencing, tennis, soccer, basketball, nature, science, arts and crafts, dance, drama, pool, sidewalk chalk, story time, campfire and face painting. The only activity they do not participate in is Mountain Biking. How many campers are in a group? Can my child be in a group with their friends? Parents can request for their campers to be in the same group with their friends and family. We try to accommodate as many friend requests as possible. However, as we can only have 12 kids in each group, it becomes more difficult to honor multiple requests. In this occasion, we will try our best to make sure they are with one of their requested friends. Where is Cub pick-up? How does it work? The Cubs will be on the main field from 3.20-3.40pm, Monday to Thursday. Parents can park in the main parking lot and walk onto the field to pick-up their camper. We ask all parents to bring their ‘Pick up Placard’ (which has your camper’s name and group on it) with you onto the field. We ask each parent to bring this to verify that they are the correct person to pick up their camper. What should I do if I can’t collect my child at the normal cub pick-up time (3:20-3:40)? We have an extended cub care option for campers that need to stay a little later. They will hang with the cub counselors and play games until all camp pick up, which starts at 4:45pm. I need to drop my cub off early/pick up late. Is this possible? Yes! We offer both AM and PM care, with drop off and pick up in the cafeteria. AM care begins at 8am and includes breakfast. PM care runs until 6.30pm, with an included dinner at 6pm. Please bring a towel, swimsuit, goggles (if needed). We will provide everything else. Every camper receives a water bottle and in the chance that your campers misplaces their water bottle, we carry lots of extras. We also have sunscreen all around campus and our counselors help put on sunscreen throughout the day. In our experience we have found that the less you pack, the less you lose! Yes, we have a lost and found box by the office. However, it doesn’t fill up until we do our camp cleanup each weekend. If your camper loses something, please check back at the start of the next week. We will keep it boxed and labeled by session for the entire summer. At the end of each summer, we donate dozens of boxes of lost and found to goodwill. Your camper does not need to pack a lunch and snack. We provide a cafeteria style lunch with lots of options catering to all dietary requirements. We have a hot option every day, a salad bar, a sandwich bar, a pasta bar, and other options. Each afternoon, we have a snack at 2:30pm. You are welcome to drop off a lunch each morning for your camper. We ask that you drop it off at the check-in table. We will take up to the cafeteria and ensure that your camper gets it. My Cub isn’t a strong swimmer, will they be able to enjoy pool time? Of course! Our focus during Cub pool time is fun. All Cubs are required to wear a life vest in the pool and most of our counselors choose to wear them as well. This allows children to safely and confidently explore the entire pool. If you have a friend who might be interested in learning more about Mountain Camp Woodside, please click on our Refer-A-Friend and we will send them information right away. If they enroll into Mountain Camp Woodside, you will be eligible for our “Refer-A-Friend” credit. This was a great first camp for my nervous 7 year old boy. Thank you! - Sara M.